The sixth edition of the Bridge Cape Pioneer Trek international mountain bike stage race, scheduled to take place in South Africa from 12-18 October, 2014, is set to deliver a next-level experience for its 500 entrants, both the podium chasers and those aiming just to complete the event within the cut-off time. The seven-day race, which follows a different route each year, will take participants over 550km through three different eco-regions in South Africa’s Western Cape province - the Great Karoo, the Klein Karoo and the Garden Route. This year’s edition will be the first as a UCI-graded event, which ensures minimum standards relating to the racing end of the field, including prize money amount and depth, as well the awarding of UCI rankings points to top finishers. While the new UCI status of the event will attract more big name professionals and offer improved benefits to the top racers, the bulk the entrants, who are simply aiming to complete the event, will continue to enjoy the Cape Pioneer Trek’s trademark benefits, including the warm small-town hospitality. The route for the 2014 edition will be announced next month. Although it changes every year, it will still include event’s trademark mountaintop finish of Stage 2 (Day 3), which sees riders ascend the formidable, majestic Swartberg Pass. This will be the first year that the first women’s team to the summit finish will receive the same prize money as the men. Bridge, the event’s title sponsor, has committed a total of R250 000 (about US$25 000 to the stage, with the first men and women’s teams each receiving R125 000 (about US$12 500). It’s the richest single stage prize in mountain bike racing. “I’m absolutely delighted about the news of the equal prize money on the big mountain-top finish stage,” said Swiss Marathon champion, Ariane Kleinhans, who, with RECM teammate Anika Langvad, won the event’s Queen Stage and the women’s race overall in 2013. “It is a demonstration of the organisers’ respect towards us ladies’ performances and their motivation to increase female participation in our great sport. Equal prize money will attract more top riders to the race and push us to a higher level. Us ladies will definitely do our best to make it an exciting race,” added Kleinhans. “Each year we fine-tune the Bridge Cape Pioneer Trek to be even more rider-focussed. Our riders aren’t only our clients, but also have become our friends and we want to ensure they feel as at home and comfortable at the Cape Pioneer Trek as possible,” said Carel Herholdt of Dryland Event Management, the company that founded and manages the event. “At the Bridge Cape Pioneer Trek, our focus is on quality, not quantity. Our stages aren’t long just for the sake it. They’re designed to offer as much reward as they offer challenges. They’re real mountain biking routes that include some of the Karoo and Klein Karoo’s greatest natural spectacles,” added Herholdt. The 2014 Bridge Cape Pioneer route will be revealed before the end of May 2014. 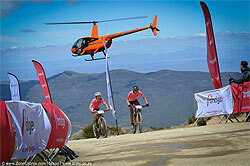 Entries can be done online at www.capepioneer.co.za/register. For more information, visit www.capepioneer.co.za. An adult male Nile Crocodile can weigh in at over a whopping 1 000kg.